KoopaTV: NES: NES is Done! Will there be a SNES: SNES? By LUDWIG VON KOOPA - ...And would a SNES: SNES be worth buying? Which do you think caught more of the general public's attention? Nintendo announcing and releasing the Nintendo Entertainment System: NES Classic Edition, or Nintendo announcing and releasing the Nintendo Switch? Even though the latter had a SUPER BOWL commercial, the commoners are more shocked by the lack of supply and subsequent worldwide discontinuation of the Nintendo Entertainment System: NES Classic Edition (NES: NES) than the Nintendo Switch's lack of supply. But here's what GameFAQs poll of the day takers think about the discontinuation. It's okay if the Wii U was jealous. But the Nintendo Switch? No! When I'm not busy personifying Nintendo hardware, it appears that I believe the Nintendo Entertainment System: NES Classic System is discontinued because of potential cannibalisation between it and the Nintendo Switch, and all of the media-attention-frenzy taking mind-share away. The NES: NES Classic Edition was always limited edition anyway. The press release and official website made upon announcement did not SAY it would've existed for a limited time only, but I always thought everyone collectively knew that. Let's assume this happens for the sake of this article. I'm pretty positive that gamers will tell you that the SNES has a far superior library to the NES. That'll be proven soon, since GameFAQs has just announced their next contest occurring shortly: The Best Year in Gaming. (KoopaTV will cover it extensively when it starts.) I predict the SNES years will trounce the NES years. But would the common masses cling to the SNES: SNES like they did the NES: NES? I don't know. It sold less, so less people grew up with it. 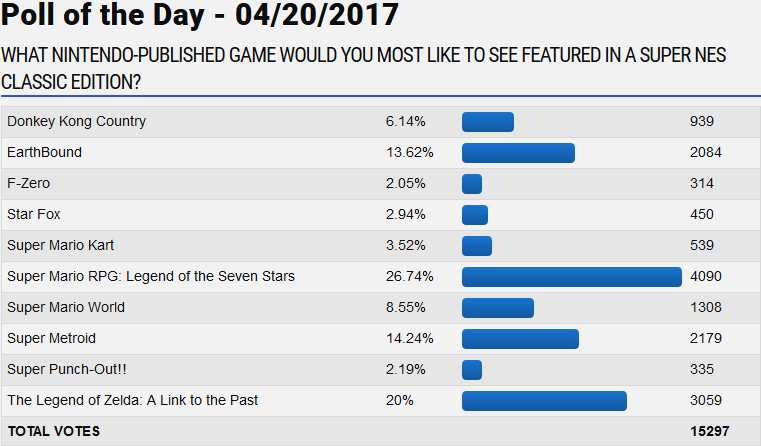 Here's what GameFAQs poll-takers would like to see on a Super NES Classic Edition. 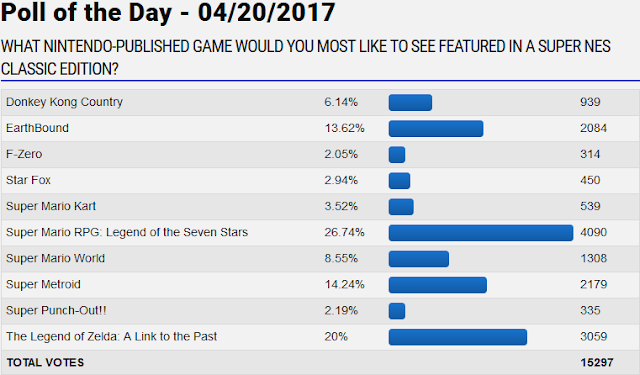 ...That, or Super Mario RPG: Legend of the Seven Stars really IS really popular on GameFAQs. I think one of the biggest hurdles is that people don't even know the Virtual Console services of the Wii, 3DS, and Wii U exist, and saw the NES: NES as their way to relive old memories. At least, one non-Nintendo person on Twitter didn't know about the Virtual Console, and I'm extrapolating from that. With the Virtual Console, I've been reliving older games (and playing some for the first time, such as EarthBound) alongside current-generation games. Plus, there's always a stream (or... drop-feed) of new Virtual Console content, unlike the NES: NES, where it's a fixed 30 games forever and you're buying all of them. But does EVERYONE know you can do that? Including on the Nintendo Switch for free (provided you pay for an Internet subscription)? If people know that, then the Nintendo Entertainment System: NES Classic Edition was being purchased just as a collector's edition, right? In that case, then no one should be complaining that it's expensive to buy on the second-hand auction markets. That's what collector's pieces ARE. Expensive! As I've been saying the whole time, there's no point in buying the NES: NES CE if your goal is to actually play games. Ludwig does play games. So much, that he's already played all of the games on that GameFAQs list. Many of them thanks to the Wii's Virtual Console! The Virtual Consoles of Nintendo's real systems are tied to your Nintendo eShop balance, which you can increase with Nintendo eShop card codes (or your debit/credit card). It just so happens that KoopaTV gives Nintendo eShop codes away — for free — as part of the KoopaTV Loyalty Rewards Program! Not only is that just another reason to buy your classic games through the eShop, but it's also another reason to be a loyal KoopaTV participant! The NES: NES didn't really have much of an effect on Fiscal Year 2017. Here's the start of the Best Year in Gaming contest! To the title of the article: Yes, there will be a SNES: SNES, and it was announced about two months after this article was written. The NES: NES isn't truly done... it will return in 2018 with a restock! My personal guess is that the company that makes the Retron series called shenanigans. I have a feeling that (the unlicensed) Hyperkin has no claim to stop Nintendo from doing what it wants with its own products. Hyperkin is unlicensed?! News to me, I'd assumed there was no way in hell they could get away with an entire line like that without Nintendo approval. Emulators are legal to make. This I also did not know. Wow, I'm learning some good stuff from this article! Emulators = generally legal to make, though the RetroN series apparently stole code from another emulator group. ROMs = Illegal to distribute (runs afoul of copyright law). I think it's only naughty if you make cartridges or discs that play pirated games on a Nintendo system, isn't it? Like that poor Tengen company from the 80's. They're kind of responsible for bringing Tetris to the masses, but they still got their pirate pants sued off. Right, the problem with the '80s is that they bypassed Nintendo's licensing seal of quality chip and made their own cartridge bypass thing, using Nintendo's own copyrighted coding. Only Nintendo has the right to do that! But making your own emulator code from scratch is fine.